After studying art in Washington, D.C., and Philadelphia, she returned to West Virginia in the 1930s. She took up residency at The Greenbrier resort’s Art Colony and became well known for her sculptures of horses. Sculptor Gladys Tuke was born in Pocahontas County on November 19, 1899. 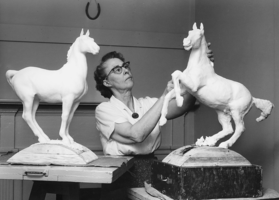 In the 1930s she took up residency at The Greenbrier resort’s Art Colony and became well known for her sculptures of horses. During World War Two, Tuke taught sculpture and pottery to soldiers who were recovering at The Greenbrier. She set up her own studio in White Sulphur Springs after the war. In 1956, Tuke reopened The Greenbrier’s Art Colony. The Art Colony’s tradition continues today as skilled artisans craft woodwork, clothing, jewelry, pottery, and other items on site. Over the years, Gladys Tuke’s sculptures were featured at the Pennsylvania Academy of the Fine Arts, the Woodmere Art Gallery in Philadelphia, the All-American Exhibition of Sculpture at the Cincinnati Museum of Art, and the Corcoran Gallery in Washington, D.C.